Though he had been in poor health for some time, President Warren G. Harding’s death on August 2, 1923, was a shock to the nation, and spurred numerous unfounded rumors. Many of the men Harding had appointed to various posts used their positions for personal gain. Though he wasn’t involved, these scandals, most famously the Teapot Dome scandal, became news in 1923. Harding decided to take a tour to the West and Alaska to reconnect with the people and promote his agenda. Accompanied by his wife and trusted advisors, Harding’s train left Washington on June 20. After giving speeches throughout the Midwest, he and his party traveled to Alaska. Harding was the first President to visit there. He advocated opening the region to the oil industry and encouraged unemployed workers to settle in Alaska. On the way back to the lower 48 states, Harding toured British Columbia, the first sitting President to visit Canada. 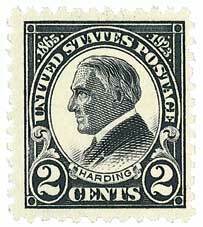 U.S. #684 – The design of the Harding memorial stamps was changed for U.S. #684 and #686 because his widow, Florence, didn’t like the profile view. As the trip continued, Harding became progressively weaker. The train traveled to San Francisco. On August 2, Harding died in a hotel suite of a cerebral hemorrhage. His body was transported by train across the country. Millions of Americans lined the track all along the route to pay their respects. When Harding’s wife, Florence, refused an autopsy, rumors swirled that she’d poisoned him to save him from the ensuing scandal charges, though no proof was ever found. Click each image to add this neat history to your collection. 16 Responses to "This Day in History… August 2, 1923"
Unfortunate for a President, Head of State, to die this way,what ever the past history may be, yet the stigma keeps attached. 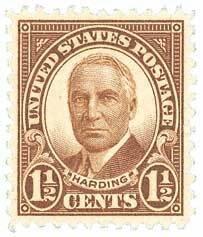 President Harding was the first President to die of a ceredil hjemerige. and FDR was the 2nd one to die of the same thing. Both were on vacation.. Do I smell a consperacy? Please excuse the spelling. I just did!!! Presidents Harding and FDR both died in office of the same problem. Do I smell a conspirecy? Your posts are great. Thank you! Thanks for doing the “This Day in History”. I enjoy reading a bit of history from every day. I remember when I started collecting stamps as a hobby (1960) my dad wanted me to do something rather than get into mischief with the kids of the neighborhood. I remember reading the small histories about the stamp from the stamp pages. Later when I had history classes in high school and college I had the inside information on many topics. Thanks, to my dad, and to the hobby of stamp collecting. Please keep up the history. I’m really enjoying your website. Identifying stamps and finding their value is much simpler than leafing through a catalog. Thanks. learning a lot of unknown facts, thanks. And now, almost 100 years later, large groups are trying to hinder the oil workers in Alaska. Will we have a stamp about this? Not a conspiracy, these presidents just ate the wrong food and clogged up their arteries, like lots of their constituents! Then and today.